There’s an industry out there called subscription video on demand (SVOD) that’s gotten enormous over the past five years. This industry is made up of companies that you pay a monthly or yearly fee, and you have access to a variety of videos, shows and/or movies. And in five years, this market is expected to be worth over $35 billion. However, with all the huge things happening in the tech industry right now, like the Internet of Things, automated driving and artificial intelligence, it’s managed to fly under the radar for the most part. Of course, the most popular company in this industry in Netflix. It has been growing here in the United States at an exponential rate now for over a decade. But more recently, Netflix and its competitors have experienced huge growth overseas as well. And as you can see in the chart below, that trend is expected to continue for the next five years. Overall, sales in Europe are expected to grow by 74% in that time period, which is a lot. 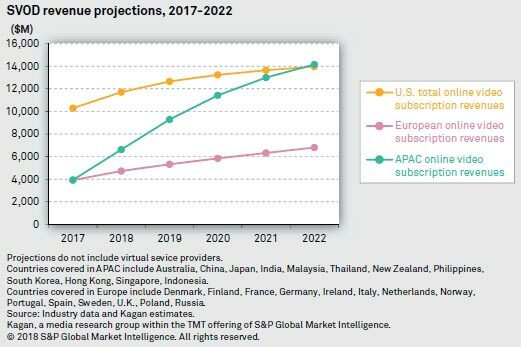 However, APAC (Asia-Pacific) sales are expected to surpass those in the United States by 2022, which means growth of 250%. The reason for this is simple: People are getting tired of cable. It’s a lot more convenient to watch what you want when you want, and as a result, hundreds of millions of people are making the switch to SVOD services. Not to mention these services a far cheaper. For example, Netflix starts at just $8 per month, and Amazon Prime is $119 per year (less than $10 per month). When compared to the average monthly cable bill of $101 last year, it’s clear why people want to transition. The biggest players in this potentially $35 billion market are Netflix and Amazon, as over 225 million people around the world have access to one or both. To diversify among several large players in this market, a good choice of investment would be the Consumer Discretionary SPDR ETF (NYSE: XLY). Over 33% of this fund is comprised of big players in the SVOD market, so its price will be affected by the growth of this market.